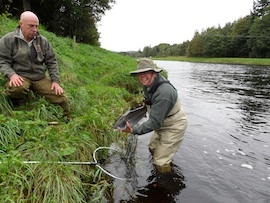 On Saturday 15th October 2011 Orri Vigfusson and the North Atlantic Salmon Fund will host an informal dinner and Ceilidh in honour of the Ghillies of the River Dee. The dinner is to be held at the Potarch Hotel near Banchory on Royal Deeside with a presentation from Orri, followed by a question and answer session. The evening will include a drink on arrival, a three course meal using local produce followed by tea and coffee. After the meal there will be a live band and dancing. A limited number of tickets are now available for Anglers and their partners who may wish to attend this event. Tickets are £30 per head and can be purchased from The Orvis Store, Banchory. Please call 01330 824319 and ask for Claire Vannet. Please note tickets are available on a strictly first come first served basis!